Technology meet the birds. Birds meet technology! Last Wednesday I had the chance to participate in #StartupGrind Seattle. We had the pleasure to have John Cook that night, for those who know, John is the Co-Founder of GeekWire the very famous Seattle tech news hub. Always be open to personal feedback. Especially the hard ones. “If you are not having fun, you are doing something wrong” – self -explanatory no? Don’t surprise people – when breaking big news or internal company conflicts, always give the chance to talk or give a heads up to whoever will get impacted. As with life (e.g. marriage), find partners/founders that complement you; ones with skills you don’t possess. Learn how to fight (again, just like in marriage). Understand that even when things blow up, you will have to come down and do it quickly. Collect a good set of mentors, including parents and colleagues in different industries. I recently attended a potluck event with friends and got introduced to this little game called Dominion. Now, hear me out i don’t think i have liked board games since i was a kid. I hated playing monopoly for 4 hours to then just stop and see nobody win. That was not what i felt with this game. We played with an expansion deck but the dynamics made it a bit hard for the players, we went back to the original game and then “it was on!”. The flow was faster therefore more enjoyable. I don’t know how i hadn’t seen this game before but I’m glad I did. I tend to not post about personal topics but this one is self-explanatory and almost required. I just wanted to share my awesome Christmas gifts this year with you all. Hope this is the beginning of new adventures. Yesterday I attended #braindump at the Hub, to discuss Windows Azure, Win8, WinPhone and Xamarin development. With a focus on app development and getting local developers to publish (on any Appstore). The event had very good speakers and a diverse set of characters in the audience. I wish more people has attended but for me it was a great kickoff to a new project. A nice surprise was meeting Chris Risner (@chrisrisner) who’s content I have been following for quite sometime. We had a chance to talk about mobile services and some of the challenges in marketing and exposing WAMS to other developers. I was happy to see the guys from Xamarin show off some of the new embedded solutions and (repeatedly) answer the questions from the crowd on how to “develop iOS and android apps from inside Visual Studio”. I gotta give it to (@bryancostanich) for his patience with the crowd and hope to see some more awesome tools in the future. Lastly I met Matt Harris Co-Founder of SendWithUS one of the few partners of the SendGrid team. His session was very personal, he evangelized on what had started as a personal quest for better email management and ended up being a company. It is hard to believe this is the outcome from 11 months of work from a 7 person team. I liked his product but more so his passion, it is hard to find people with that determination. Abe’s Insight: I’m still in awe with some of the gaps in knowledge from the technical audiences I interact with. The fragmentation in platforms has been there from the beginning (this is not news). We have been developing iOS apps, Android apps and lately Win8 and WinPhone separately; the search for that “one IDE to rule them all” should be over by now…seriously. It is all a business driven decision, going the HTML5 route vs the Native one is not a matter of user base and numbers but one of product development and how an app should be an extension of your company/product/business. 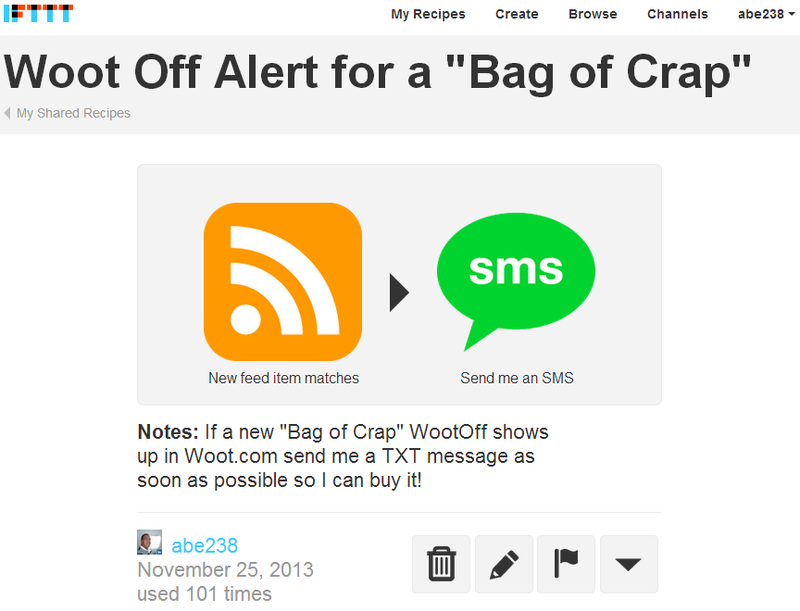 My Woot Off Bag of Crap IFTTT Recipe Keeps Trending Up! Today I had the chance to meet @AnthonyBorton at the .Net Developers Association. He shared some of the cool features from VS2013 and TFS Online (or maybe i should call it “Visual Studio Online”?). I enjoyed some of the new linking inside Team Rooms and quick charting features. I hope people don’t over do it with the charts though 🙂 I do see a winner with some of the new Load Performance features powered by Azure.